Talk about The Comeback Spy. 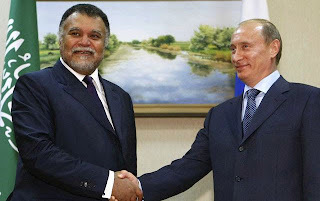 Prince Bandar bin Sultan, aka Bandar Bush (for Dubya he was like family), spectacularly resurfaced after one year in speculation-drenched limbo (was he or was he not dead, following an assassination attempt in July 2012). And he was back in the limelight no less than in a face-to-face with Russian President Vladimir Putin. Saudi King Abdullah, to quote Bob Dylan, "is not busy being born, he's busy dying". At least he was able to pick up a pen and recently appoint Bandar as head of the Saudi General Intelligence Directorate; thus in charge of the joint US-Saudi master plan for Syria. The four-hour meeting between Bandar Bush and Vlad the Hammer by now has acquired mythic status. Essentially, according to diplomatic leaks, Bandar asked Vlad to drop Syrian President Bashar al-Assad and forget about blocking a possible UN Security Council resolution on a no-fly zone (as if Moscow would ever allow a replay of UN resolution 1973 against Libya). In return the House of Saud would buy loads of Russian weapons. Vlad, predictably, was not impressed. Not even when Bandar brazenly insisted that whatever form a post-Assad situation would take, the Saudis will be "completely" in control. Vlad - and Russian intelligence - already knew it. But then Bandar went over the top, promising that Saudi Arabia would not allow any Gulf Cooperation Council member country - as in Qatar - to invest in Pipelineistan across Syria to sell natural gas to Europe and thus damage Russian - as in Gazprom's - interests. When Bandar saw he was going nowhere, he reverted to his fallback position; the only way out in Syria is war - and Moscow should forget about the perennially postponed Geneva II peace conference because the "rebels" will be a no show. Once again, Vlad did not need a reminder that the Saudis - in "cooperation" with Washington - have now taken over the "rebel" galaxy. Qatar has been confined to a (expensive) dustbin, as Vijay Prashad alludes to here. This is part of Washington's plan - if there is one - to isolate the Syrian Muslim Brotherhood and its shady jihadi ramifications/connections. Wily Bandar, for his part, is not a fool to believe his own propaganda; he knows Moscow has more complex geostrategic interests other than just keeping Syria as a weapons client. And he might have suspected that Moscow simply does not bother with Gulf competition in Pipelineistan targeting European markets. It's instructive to remember that in 2009, Damascus did not sign an agreement with Qatar for a pipeline via Syria; but they did sign the memorandum of understanding last year for the US$10 billion Iran-Iraq-Syria pipeline. So the point is for Damascus, the deal with Iran was much better; and if the pipeline is ever built Gazprom may even be part of it, in infrastructure and distribution. What Moscow has concluded is that Gazprom won't lose its energy grip over Europe to the benefit of Qatari natural gas. A case can be made that Gazprom holds more power over the distressed, decaying, virtually insolvent eurozone than the European Central Bank (ECB). What Vlad does fear is a potential post-Assad utter chaos, to be fully exploited by Salafi-jihadis. It's never enough to remember that from Aleppo to Grozny it's roughly 900 kilometers. The next stop for the Global Jihad in Syria would be the Caucasus. And that's where Bandar Bush and Vlad the Hammer might converge; their mutual strategic interest is to reign in jihadis - although Bandar, in fact, is also weaponizing them. 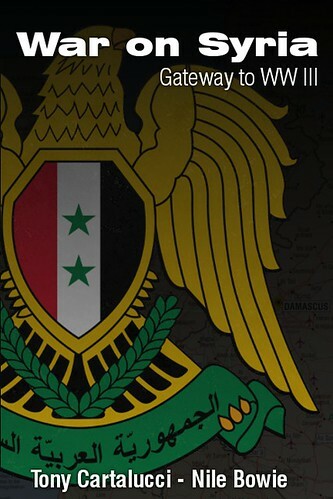 Moscow won't drop Damascus. Period. At the same time, as Bandar threatened, Geneva II seems more unlikely to happen than the Obama administration ceasing to drone Yemen to death. 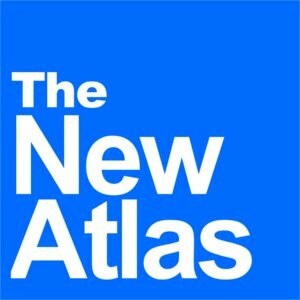 As Asia Times Online has extensively reported, the name of the game, in practice, remains Syria as the new Afghanistan, with the House of Saud in control of all aspects of jihad (with Washington "leading from behind"). Deadly historic irony also applies; instead of clashing with the Soviet Union, now the Saudis clash with the Russian federation. Bandar is simultaneously the newWeaponizer-in-Chief, as well as Liberator-in-Chief of Syria. The Comeback Spy is not accounting for future, inevitable, ghastly blowback; what's alarming is that the Obama administration is right behind him. Bandar Bush's visit to Moscow simply could not have happened without a green light from Washington. So what's the (muddled) master plan? The Obama administration seems to believe in a remixed Sykes-Picot - almost a century after the original. The problem is they are clueless on how to configure the new zones of influence. Meanwhile, they're letting the Saudis do the heavy lifting. The first step was to eliminate Qatar from the picture. It's astonishing how fast the emirate, up to two months ago a prospective mini-superpower, now has been reduced to less than an afterthought. Yet Bandar by now may have seen the writing on the (bloody) wall; Bashar al-Assad will be in power until the 2014 elections in Syria, and may even win those elections. The Saudis might accept a form of compensation in Lebanon, with their protege, the cosmically incompetent Saad al-Hariri, back in power in a coalition government including the political branch of Hezbollah - not the other one which the European poodles branded "terrorist". This also seems unlikely. So what is Bandar the Liberator to do? Well, he can always direct his private jet to Dallas and liberate his sorrows in a sea of single malt, provided by the House of Dubya.